The Sukhoi Su-30 Flanker-C is a two-seat, twin-engine, multi-role fighter for all-weather, air-to-air, and air-to-surface deep interdiction missions, developed by Russia's Sukhoi Aviation Corporation. The Su-30 started out as an internal development project in the Sukhoi Su-27 family. The design plan was revamped and the name was made official by the Russian Defense Ministry in 1996. While the original Su-27 had good range, it still did not have sufficient range for the Soviet Air Defense Forces, which needed to cover the vast expanse of the Soviet Union. The development began in 1986 on the Su-27PU, an improved-capability variant of the Su-27 capable of serving as a long-range interceptor or airborne command post. The two-seat Su-27UB combat trainer was selected as the basis for the Su-27PU, because it had the performance of a single-seat Su-27 and long-range missions require two crew members. The aircraft was fitted with a retractable in-flight refueling probe. The probe is offset to the left side of the nose, and the Infrared Search and Track (IRST) sensor was offset to the right. The rear cockpit received a large CRT display which provides tactical information regarding target intercepts. The navigation and fly-by-wire systems were also upgraded. It was fitted with an updated radar, providing some ability for ground attack and to track and engage multiple aerial targets simultaneously. An Su-30M two-seat multi-role variant was proposed for Russian use and a few may have been built in the mid-1990s for evaluation. Sukhoi also proposed an export variant, Su-30MK, where "MK" stood for "Modernizirovannyi Kommercheskiy" (Modernized Commercial). The Su-27PU had 8 hard points for its weapon load, whereas the Su-30MK's combat load is mounted on 12 hard points: 2 wingtip AAM launch rails, 3 pylons under each wing, 1 pylon under each engine nacelle, and 2 pylons in tandem in the "arch" between the engines. All versions can carry up to 8 tons of external stores. In addition, the Su-30Mk is fitted with a Gsh-30-1 gun (30mm caliber, with 150 rounds). The kit is packaged is a large box with the fuselage halves twist-tied to a cardboard panel. 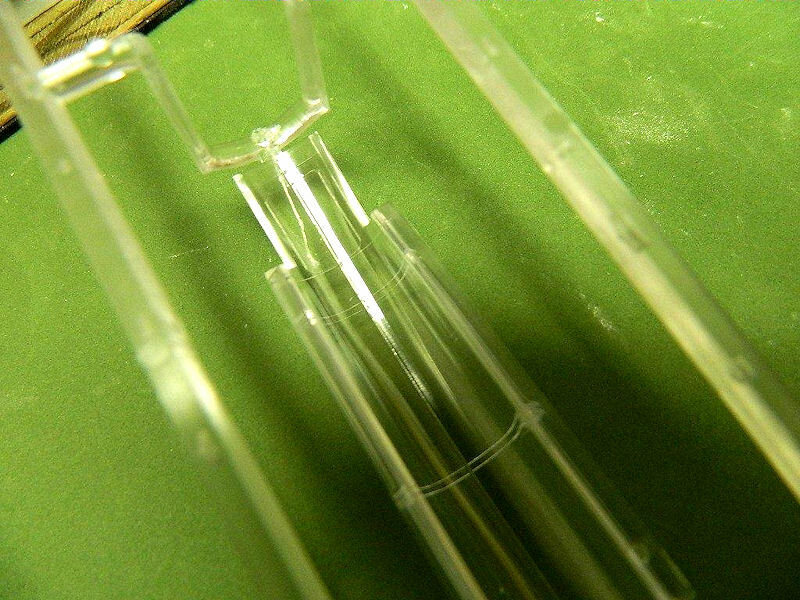 There are seven medium grey plastic sprues, two clear parts sprues, and a photo etch fret. Kit features fine engraved panel lines, subtle rivet detail where appropriate, detailed tandem cockpits, landing gear, separate control surfaces and leading-edge flaps, choice of stowed or extended refueling probe, optional position speed brake, and bypass inlets. The underwing pylons included both raised and recessed detail. There are several parts not used in this build. Instructions - The instructions are an eight-page foldout format, with a separate set of instructions for the paint schemes and decal locations. There are 13 exploded view steps to the build, with paint colors noted in each step. The instructions also include a paint manufacturer guide. Clear parts - The 2-piece canopy is crystal clear, and the IR sensor is molded separate from the windscreen. Photo-etch - Intake screens, canopy mirrors, wheel well accents. External stores - 2 each: R-27, R-73, R-77, and Kh-31missiles, plus wingtip jamming pods. Decals - Marking for three aircraft are included: Russian 'Blue 501' and 'White 502', 2006 Demonstration Tour; Chinese PLAAF 'Black 24'. Fuselage - The first step involves drilling holes in the wing underside and fuselage bottom for the future mounting of the weapons. In step 1, holes are shown as being required in the ventral tunnel between the engines, while step 5 has openings drilled in the bottom of the engine nacelles. Both instructions are correct: the two missiles may be located in either location, although the missile pylons are too long to properly fit in the tunnel. The fuselage halves are actually from an earlier issue of the Su-27 and will require a bit of surgery by the builder to graft the Su-30MK front section onto the fuselage. The instructions clearly show what portion of the fuselage top half must be removed. I decided to cut the front of the fuselage off by scribing and sawing from the inside, as the guide grooves were more pronounced than those on the exterior side. Once the front portion was removed, I taped the rear top section of the fuselage to the bottom half to test fit the correct nose section. Some additional sanding and trimming was required before everything fit correctly. I glued the front section to the fuselage half and allowed that join to dry overnight. The resultant gap at the join was filled with Milliput and sanded smooth when cured. I also applied Milliput on the inside to reinforce the new joint. Although this join may initially be weak, once the top and bottom halves of the fuselage are glued together, the new join is further reinforced by the bottom half. There is also the option of installing the refueling probe in the extended position. This step must be completed before the fuselage halves are closed up. I chose to use the extended position. Nose Cone - The single-piece nose cone has an internal mounting recess, but the fuselage does not have a corresponding tab. Nevertheless, the cone appears to be symmetrical and there was no problem with alignment. I did replace the nose pitot tube with telescoping brass tube, as the plastic kit part was a bit too thick and would not survive too long during subsequent steps. Engine Intakes - The engine intakes are made from two halves, by-pass louvers that are optionally open or closed, plus PE FOD screens. Not being certain of how much would be seen down the throats of the intakes with everything in place, I made a concerted effort to eliminate all raised ejector pin marks and joints. The turbine faces are separate parts that must be installed before the fuselage halves are fitted together. Cockpit - Each seat is comprised of four parts, with seat harnesses molded integral with the seat. There is plenty of raised detail to be painted to look like the real thing. Careful painting and detailing will result in a rather impressive cockpit. Canopy - I was well into the build when I discovered a crack in the rear portion of the canopy. 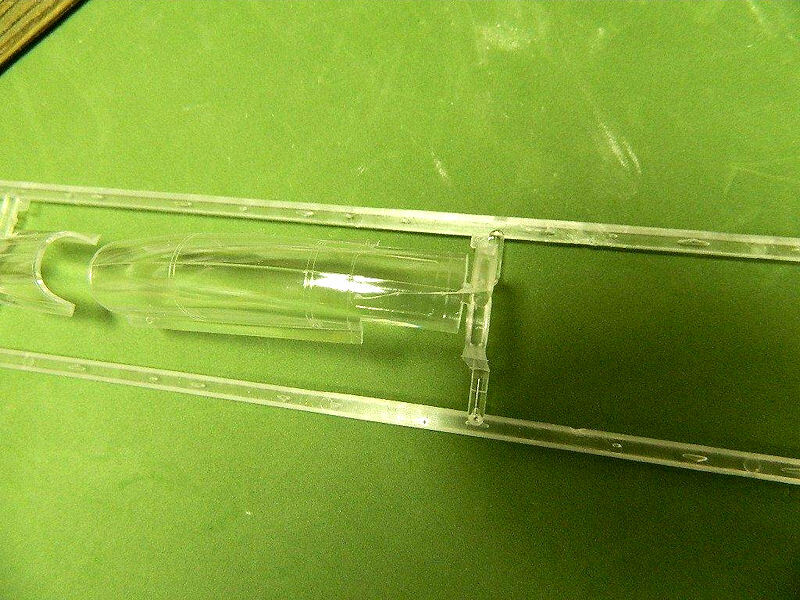 The clear part (E-2) is molded with a single attachment point to the carrier sprue. It appears the part may have flexed during shipment and handling, which resulted in the crack. I contacted the supplier via email, and after several weeks received no response. I finished the model with the cracked canopy. Landing Gear - The main landing gear is quite substantial for a model this size, and reflects the size of the real aircraft. On the other hand, the nose gear is a bit flimsy once the model is completed. Care is required when handling the completed model to avoid breaking the nose gear strut. The mud guard for the nose wheel is a bit thick and could be thinned for a more scale appearance. The main gear struts are quite simple and involve just two parts each, plus the wheels. I added hydraulic piping and power wiring to the gear as shown in my references. Wings and flying surfaces - The wings are molded integrally with the fuselage, but include positional flaps and leading edges. 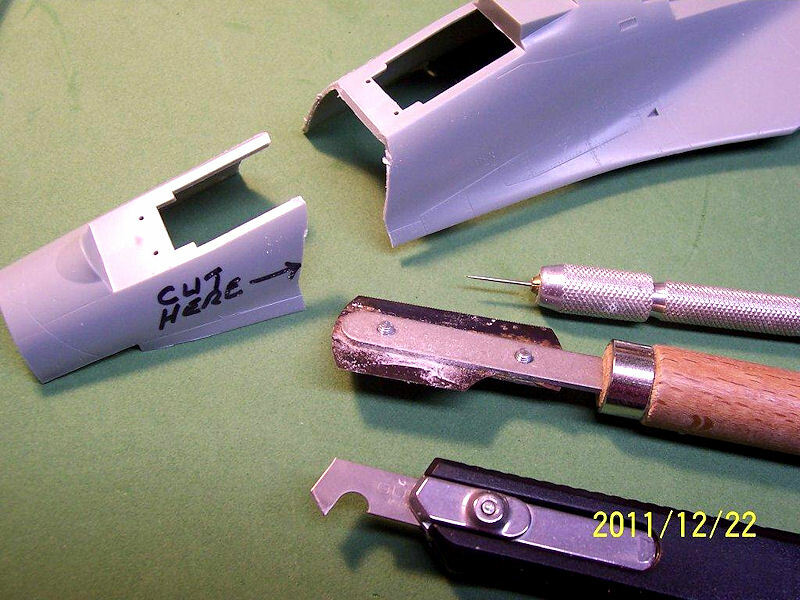 There are small sprue spurs on the wings' top and bottom surfaces that must be carefully removed. When it came time to fit the top half of the model to the bottom, I found it a bit challenging to align the parts before the application of solvent. I used several clamps to close the various joints, applied the solvent and allowed the joints to dry overnight. I worked my way around the model to fix the top to the bottom. Once the join had thoroughly cured, I applied putty to fill the resultant gaps, and sanded everything smooth. The horizontal stabilizers fit to small openings in the fuselage rear. I replaced the small mounting nubs with brass rod for a stronger connection. I installed the two parts after all painting was completed. Vertical Stabilizers - Step 11 requires the tips of each vertical stabilizer be removed and replaced with parts G37 appropriate for the SU-30MK. This was done easily and the new tips fit well, with only a bit of putty being required. Engine Exhausts - Each engine exhaust is made up of two parts, and the detail is sufficient. 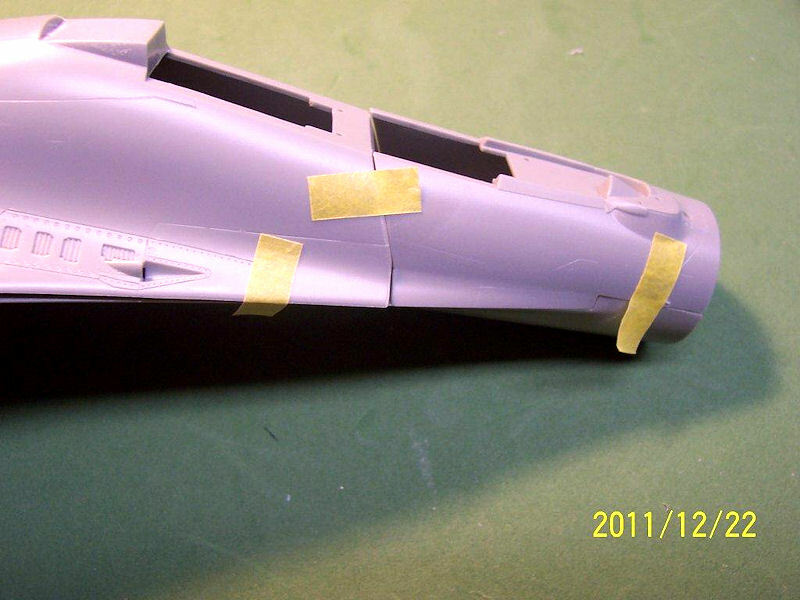 The two parts for each side may be painted before assembly to enhance the molded-in details. 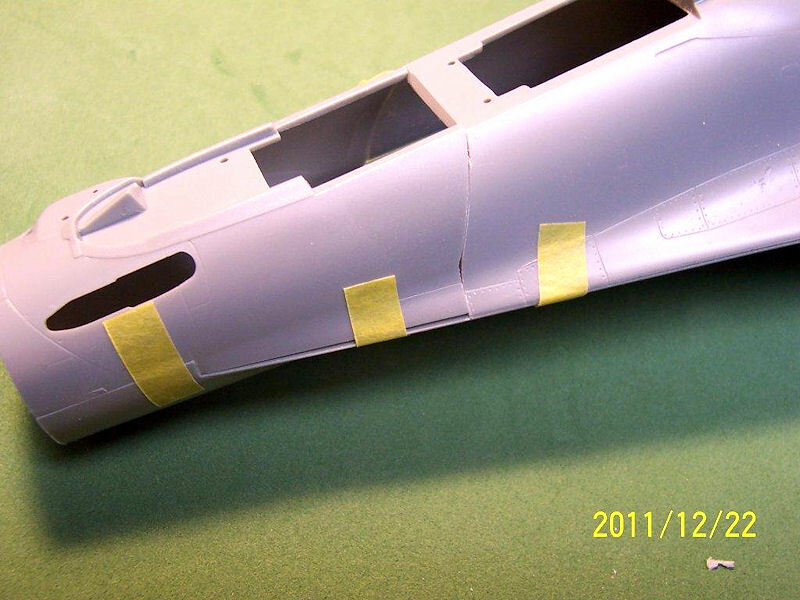 The exhausts fit into the rear of the fuselage once the top and bottom halves of the fuselage are glued together. This was done after the finish painting was completed. Weapons - Each missile is a small model unto itself. Once assembled, I drilled two holes in each missile body and the respective pylons for the addition of short lengths of brass rod to reinforce mounting to the pylons. Research on the Internet offered several color schemes for each missile. This was probably the most challenging decision part of the build: what scheme do I use? I ruled out the Chinese version almost immediately, only because I wanted to do a Russian aircraft. 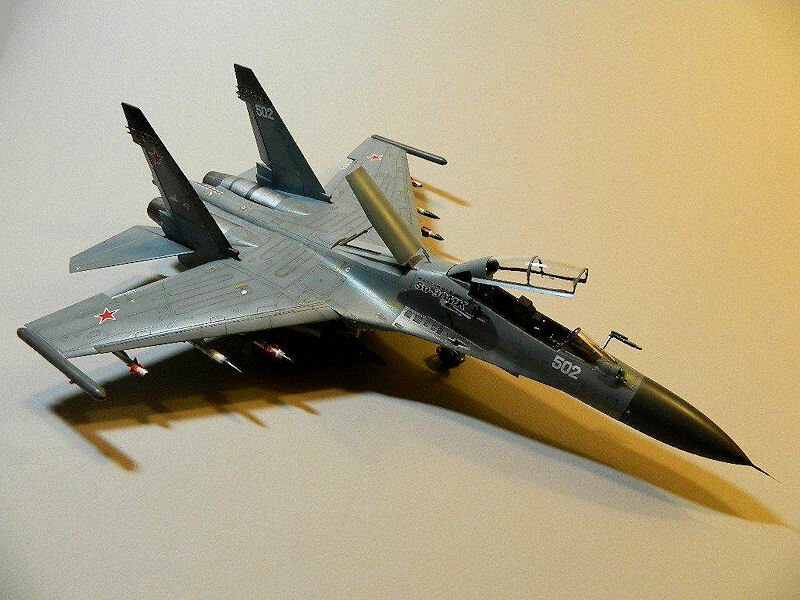 The blue Flanker paint scheme is most appealing, but I felt it had been overdone in the modeling community. I decided to do the grey version, or "White 502". I primed the model with Rustoleum's Painters Choice and pre-shaded all panel lines. I used Model Master Acryl and Polyscale paints for the finished scheme. Alclad metallic paints were used for the bare metal panels and exhausts. Panel lines were given a wash of burnt umber oil paint. I did find that some of the recessed panel lines are a bit understated, especially on the undersides and, in a few instances, the panel lines just fade away. Once the paint had thoroughly dried, the model was given three applications of Future in preparation of the decals. The decals are made by Cartograf. In addition to the national markings and aircraft numbers, company logos and stenciling are included. The blast shield at the gun location is also represented by several silver decal sections. 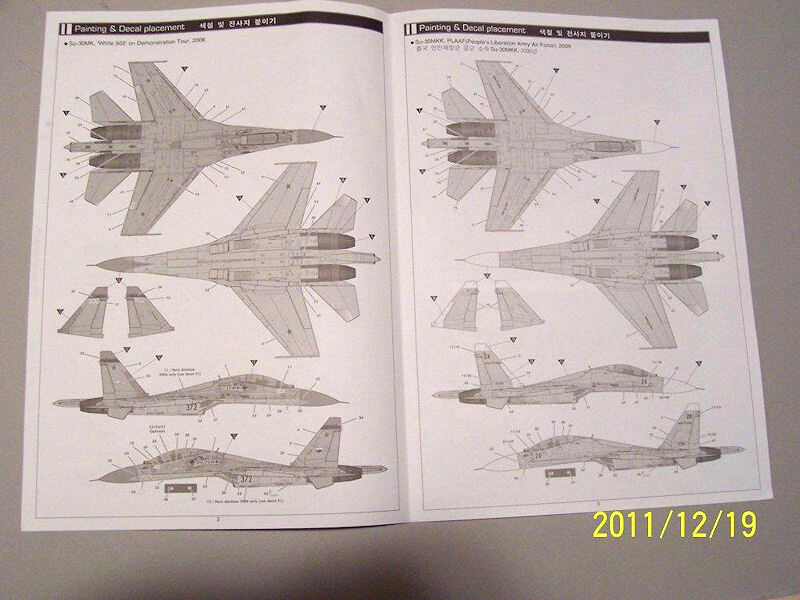 The raised details for the blast panels are a bit undersized from the Su-30. Rather than using decals, I painted mine with Alclad. After a quick soak in water, the decals were ready to be applied. All reacted well to Microset and Microsol. Everything was then sealed with a thinned application of Model Master Acryl satin. 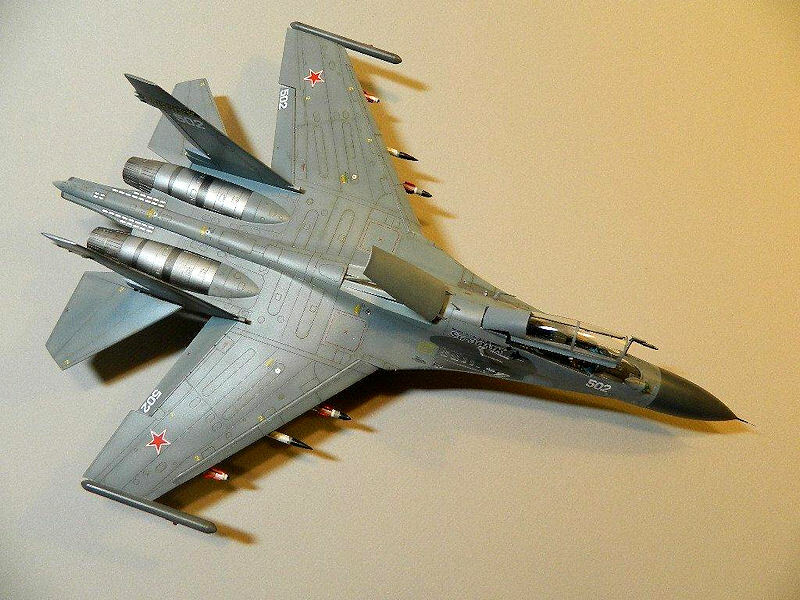 The finished model certainly captures the look of the Sukhoi Su-30. It is a big aircraft and has a good deal of aesthetic appeal. It is sort of good-looking ugly. 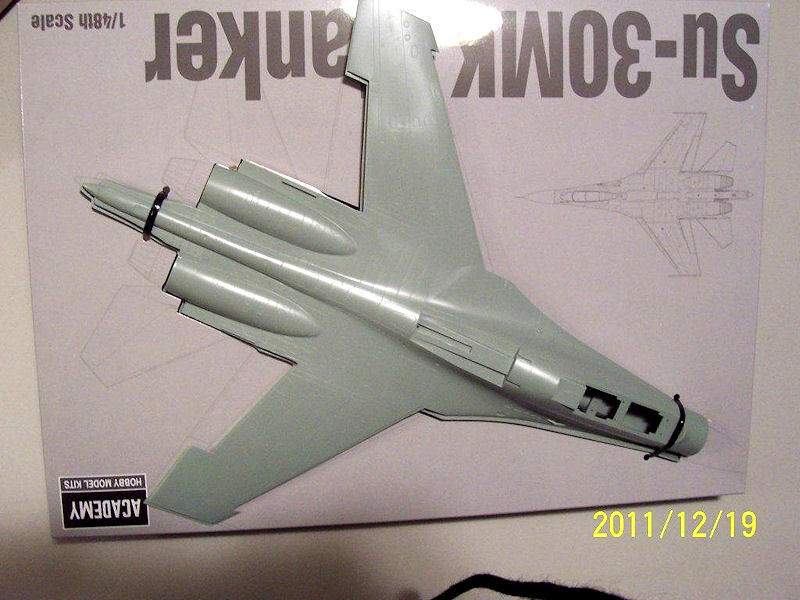 The model kit's basic airframe parts date back to the original issue of the Academy 1994 Su-27 two-seater. There is a small bit of flash to be found in various locations, but what there is may be eliminated with a few swipes of a sanding stick. I wish to thank MRC Academy and IPMS/USA for the opportunity to review and build this kit. 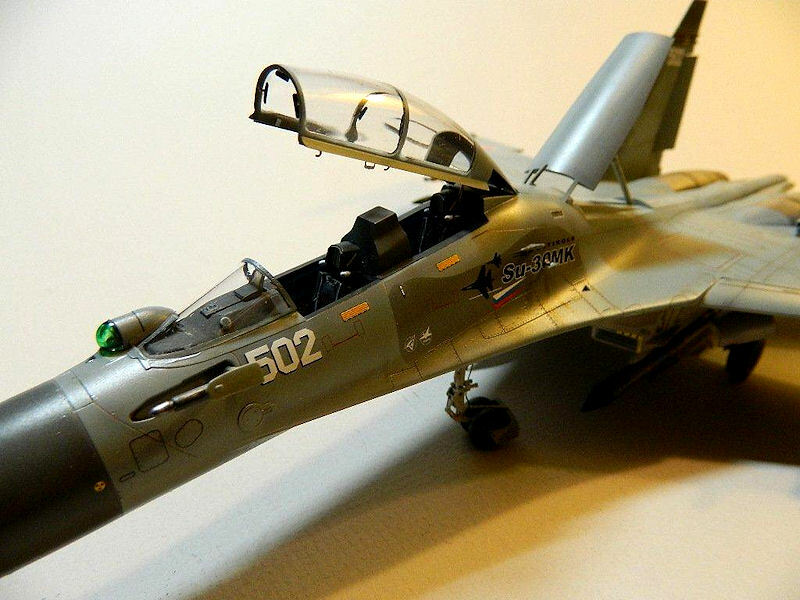 Any fan of modern Russian aircraft is urged to add this kit to his collection. This is a big model and, with the many countries that fly this aircraft, the options of paint and camouflage schemes are almost endless. I really enjoyed this build and am quite pleased with the end results. 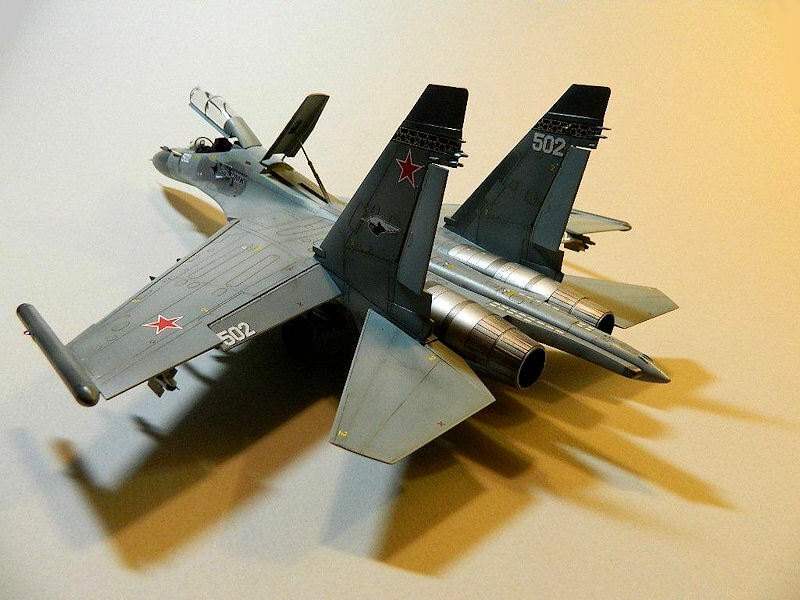 I highly recommend this kit for any fan of modern Russian aircraft. Clear the display shelves: this is a big model. 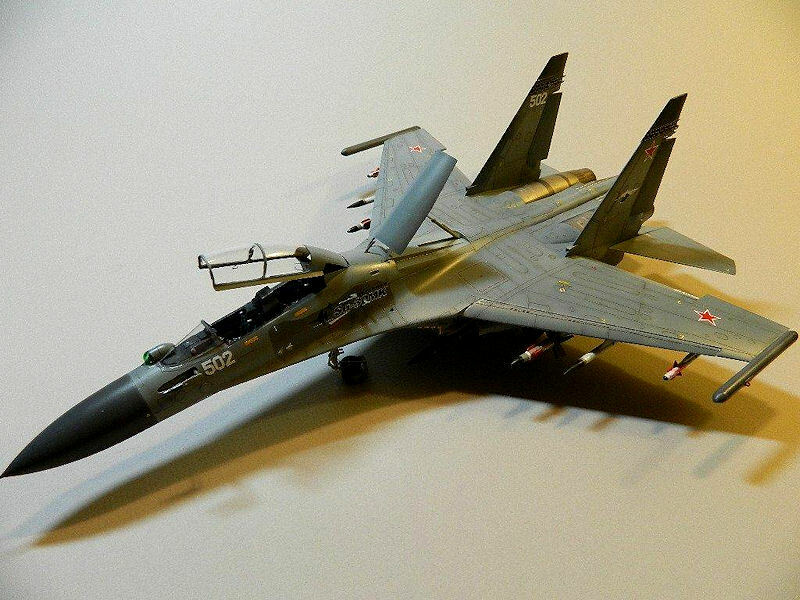 Would I build another Sukhoi? You bet! !